The last weekend of October my neighbor Hank and I were invited to a very interesting party five miles east of Austin. Hank’s daughter lured us in with the promise there would be an actual piano burning taking place, an odd tradition started by the family hosting the party. That’s a short ride for such a spectacular show so we accepted readily, saddling up the mountain bikes and setting out toward the rising moon. It was a chilly night as one would expect in Minnesota this time of year but we made short work of the ride, arriving at the super-long country style driveway in 20 minutes. From there we quietly crept on to the party scene as to not draw too much attention to ourselves. That didn’t last long though as the festive crowd embraced us warmly with hugs and loud chatter fueled perhaps by several bottles of the family’s homemade champagne being emptied around the fire. The hospitality was appreciated though and the party was fun and even included a live band in the garage. Around midnight folks started gathering near the piano and the excitement began brewing. “Do you just throw it in the fire?” Hank and I asked ignorantly. “Yep, until it can’t be played anymore,” they replied. Now we were really hooked. All sorts of questions come to mind: How many songs will they get to play before it’s over? How long will it take? Has Elton John ever tried this? So we joined the fray gathering around the piano to witness its public execution by combustion. An amplifier was plugged in with a microphone in front of the bench. The player finally appeared draped in a long black hood like the grim reaper to add to the drama. Once he was formally seated stage hands put flame to the front of the upright piano at the bottom as the player began to strike the keys. The first song of the night was a festive sing-along, an original and wonderful ode to the family Champagne recipe. After that the pianist moved on to a full set of pre-arranged “fire” themed songs. By the end of that song the piano was really torching up and the sheet music he’d brought along was difficult for the player to read through the billowing smoke now pouring from the upper panel of the suffocating instrument. Next was the Johnny Cash epic “Ring of Fire,” which is familiar enough to whip any party into frenzy, let alone playing it on a burning piano. Everyone sang along enthusiastically as the fire began to lap aggressively over the top of the piano. The last song of the night was “Great Balls of Fire,” but before he got through the first verse the heat penetrated the keys as they started sinking into the board with only a few high notes still playable. The player banged hard on the remaining keys until they became impossible to touch and finally stepped away. 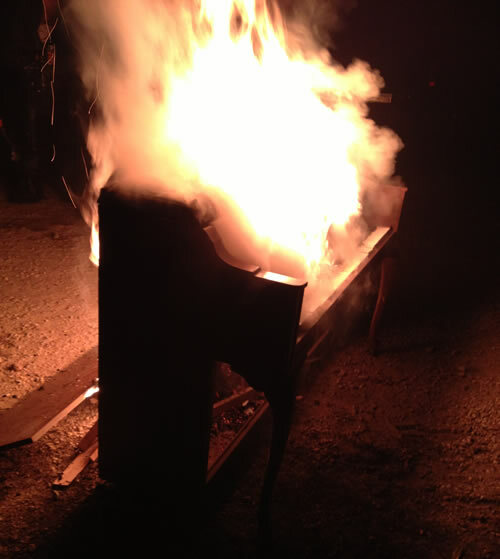 Within seconds the piano was fully engulfed. Soon the entire grand instrument was reduced to smoldering ruble and we left the party the same way we entered, quietly down the big driveway toward the highway. With the moon now high in the sky we rode slowly toward home, warmed by the memories of an epic night. Traffic Tip: Answers: four songs, 13 minutes and no; Elton John has never played a burning piano.